The gritty realism of this conflict journalism game has fledgling reporters in mind. Preparing journalists for the dangers of war reporting is an expensive affair, something which is beyond the reach of most freelancers and students. To help prepare them for the stress of working in a combat zone, the team behind WarCo (a war simulator which replaces your gun with a camera) have announced that they're working on a special "training" version of their game which will cater to the needs of reporters who are unable to undertake proper training. In an interview with the BBC, Tony Maniaty, the mind behind the game, said that he doesn't see why his game couldn't be helpful in training conflict correspondents. "Surgeons have been training how to do operations with video games and interactive games are even being used to treat soldiers suffering from post-traumatic stress disorder. It's very common," he said. "I would never say this game should replace proper hostile environment training but if we can save the lives of a few journalists it'll be worth it." WarCo - and its training aspect - has been criticized by several experienced war correspondents for failing to portray enough realism. "My worry is that it dehumanizes a war zone," commented Allan Little, one of the BBC's most experienced combat reporters. "The key to understanding a war is to understand individuals who are living through it - and there aren't really any individuals in this game...I think anything that encourages the view that you can understand real-life shooting wars better by playing a game has to be treated with caution." Others, such as James Rodgers, a senior lecturer in International Journalism at London Metropolitan University, worry about the "glamorizing" effect of games like WarCo. "I can see how something like this game could potentially be a useful training aid for a generation that's very comfortable with video games," said Rodgers. "But I think it really needs to avoid glamorizing the profession because people really do get killed." According to the Committee to Protect Journalists, almost 40% of the 877 journalists killed at work since 1992 have died while covering a combat zone. While WarCo can't hope to simulate war reporting any more than Modern Warfare can hope to simulate the real experiences of soldiers, it can at least hope to shed some light on the difficulties faced by journalists at war. 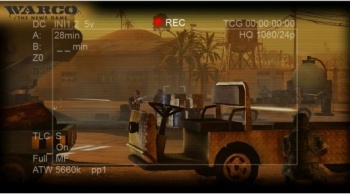 It's highly unlikely that WarCo will be anywhere near as useful as Virtual Iraq, the PTSD-treatment game mentioned by Maniaty, but if its mechanics are constructed well enough, it could give people a glimpse of what life is like behind the camera at war.